Check out the hottest Windows Mobile devices at our Expansys store! "Web Tiles enables you to create live tiles out of any web page. You can select the area of the page that will be shown on your live tile. You can also choose how often your tiles will be updated. 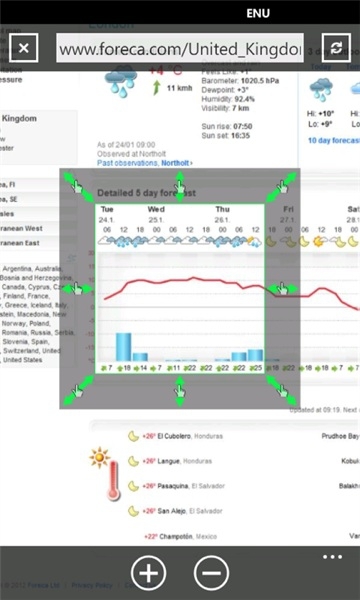 This is great for example for weather or stock graphs and image feeds." Here's what appears to be a very effective app for WP7. Do you really like live tiles? I bet you do and now you can create a tile from any web page. You can configure the tiles to update in a number of ways, or force one to update every 15 minutes by tapping on it. A trial version is available, which limits you to three fixed addresses, but that should be enough to win you over. Give it a try! All times are GMT +1. The time now is 01:46 AM.